This was a home project using the Technics SP-25 broadcast turntable, a genuine Technics plinth and a Micro-Trak 16 inch tone arm. 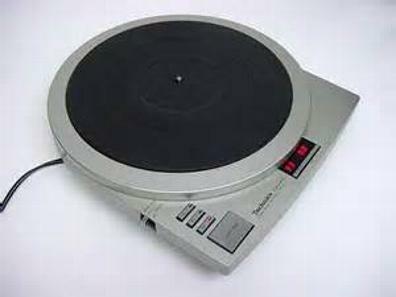 This two speed turntable will accomodate 16 inch transcriptions, down to 7 inch 45's. The variable speed control is a knob that turns and the speed is shown on the strobe. This is the SP-15; the three speed model. Differs from the SP-25 in that there is no speed strobe and the speed variation is controlled by momentary buttons with an LED readout. Note: As part of the off/on switch, all controls can be disabled. 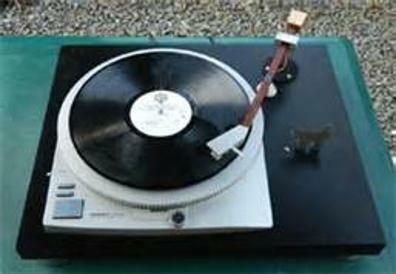 Both the SP-10 and SP-15 require a plinth, or a countertop cutout. When this SP-15 was first acquired, the speed was violent. There was no control whatsoever. While the service manual directed this problem to IC 201 and 202, the actual problem was three cold solder joints on the circuit board under the stator. After soldering, all speeds are stable and correct. The lower left picture shows the stator. This is where the cold solder joints were found. There are six screws. Remove three screws next to the arrows. Gently lift the stator and remove the connector. Next, remove the remaining three screws. The silver ring will then lift off. The extending portion of the circuit board is now exposed, showing three connections in a triangle.